With yet another damned deadline, this time for loans, looming tomorrow the Harriers manager Mark Yates has plunged in head first and signed Glenn Wilson from the Harriers sworn rivals, Rushden, on loan until the end of the season. The right sided defender has obviously been bought in as a replacement for Jeff Kenna who is looking more and more out of sorts as the back log of games start to mount up. With Jeffery also expected to be leaving at the end of the season then Wilson could be being looked at as a permanent replacement next season. 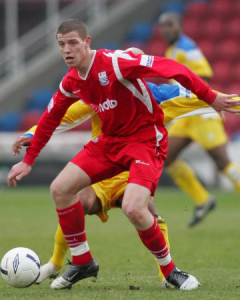 The twenty one year old joined Rushden after being released from Crystal Palace in July 2006. He never made an appearance for Palace but has made thirty one for Diamonds including the game at Aggborough earlier in the season when both sides struggled to get through a goal-less draw. Wilson isn't able to play in the Trophy final on May 12th because he played for Rushden in the tournament at Gravesend when they were knocked out in a 2-1 defeat. It's presumed that he'll be making his debut for us at St Albans this coming Saturday.